WILMINGTON — Tyler Seguin is here, with a pristine Bruins sweater, No. 19, set aside for the taking. All he has to do is reach for it, eagerly wrap his strong but adolescent arms around the black-and-gold fibers and slip it over his muscular, well-sculpted torso. Simple. Ready to wear. Such an easy fit. But the question remains, is he ready for the fit? For the record, the most talked-about Bruins rookie since Joe Thornton (last seen in the Hub in that No. 19 sweater) said those words evenly and confidently, yet with no amount of hubris nor hint of braggadocio. Seguin’s “ready’’ is a healthy one, a smart one — verbalized as respect for those already on the roster, and also in acknowledg ment that a mediocre showing in the next 2-3 weeks could return him to the Plymouth Whalers for another year of junior hockey. “It doesn’t really feel like anything yet,’’ said Seguin, sitting in the hovel that is the rookie’s dressing room at Ristuccia Arena. “Because the dream and the goal has never been to be right here right now. It has been to be here 2-3 years down the road, you know, playing for an NHL team, eventually starting a family, living in a house, knowing that I am in the spot. That’s the actual dream. At the moment, not even 10 weeks since the Bruins made him the No. 2 pick in the NHL draft, Seguin is the latest phenom-in-waiting — waiting, that is, to be judged. Thornton, the first pick in the 1997 draft, arrived here 13 Septembers ago, following a season in which the Bruins finished last in the Original 30. Touted as a franchise savior, hyped as an Eric Lindros/Mike Modano hybrid, Jumbo Joe suffered through humble beginnings his rookie season (3-4—7) and didn’t evolve as an offensive force until his sixth year in a Boston uniform. The frustrations inherent in those underwhelming years, in part, led to the abrupt trade that sent him to San Jose in November 2005. Thornton went from being handed a job to being served his walking papers. Seguin has arrived under similarly high expectations, but vying for a spot on a team with far stronger underpinnings than the 1997-98 Bruins and one that will make him prove, earn, fight for his professional worthiness. This is a club that has reached the playoffs three consecutive seasons and one that, save for its vaudevillian collapse against the Flyers in Round 2 of the postseason, should have reached the Eastern Conference finals last spring. The Boston roster is deep enough at forward, especially at center, that Seguin is expected to last only a few days at center next week, during rookie camp only, then get bumped over to right wing when he and his fellow newbies mix with the veterans. The center slots will be filled by Marc Savard, David Krejci, Patrice Bergeron, and the newly-acquired Greg Campbell. Total NHL experience, playoffs included: 1,848 games. “I find I get more points [at wing], actually,’’ said Seguin, who spent roughly half of his rookie season in Plymouth (Ontario Hockey League) on right wing. “I mean, at center, you probably waste more energy and get tired because you are flying all the time. “But at wing, you could be standing high in your end for 30 seconds, catching your breath, while people are battling it out in the corners, and that’s when you get a lot of chipped pucks or flips off the wall for breakaways. I found I got a lot of goals that way. Seguin won’t be the sole wannabe vying for attention from coach Claude Julien and the front office. Forwards Jordan Caron and Joe Colborne, both former first-round picks, will be trying to crack the varsity. This will also be an important camp for Zach Hamill, another center, selected No. 8 overall in the 2007 draft. Perhaps it’s not do or die for the spindly Hamill, but it’s time he began to display an NHL-ready game. None of the other contenders arrives with Seguin’s pedigree. He is exceptionally fast, with a deceptive change of speed adding dimension to his game, and his dynamic legs and sizzling snap shot make for a tantalizing package. Bruins general manager Peter Chiarelli figures Tampa Bay’s Steven Stamkos (51 goals, 95 points in his sophomore season) is an apt comparable. Seguin at his best, said Chiarelli, utilizes all four gears, has exceptional on-ice awareness, and delivers pucks to the net with a devilish snap of the wrists. All that said, Chiarelli also preaches caution, noting how few 18-year-olds transition easily and effectively to the NHL. “A lot of it is age and strength; not many 18-year-olds are strong enough,’’ said Chiarelli, taking note of some classic exceptions over the years such as Ray Bourque, Lindros, Sidney Crosby, and Mario Lemieux. “You see kids do it in football, but they’re generally 21 or 22. Even baseball, if they do it right away, it’s usually a junior out of college or a kid who has gone through A, Double A, then Triple A ball. Only a couple of years ago, Milan Lucic was in much the same position, albeit on a Bruins club with far more job openings. To walk into the room as a bright-eyed teenager, recalled the hulking winger, can be intimidating. Lucic’s advice for the rookie: play the game that got you here, avoid the prospect of going home with a head full of second thoughts about how you should have played the game. Like the fan base, Seguin’s would-be teammates are curious to see how the kid’s game translates at the next level. “I’m excited to see what he can bring, for sure,’’ said Lucic. “Obviously, when you have a guy [recognized as] a high-profile player even before he has played here, you want to see what he’s all about. Seguin has been living without a fallback plan, an alternative to the pro hockey life, since his early teenage years. His father, Paul, played hockey, including a four-year stint on the University of Vermont blue line. His mother, Jackie, played, too. A center with an impressive set of hands, according to her 18-year-old son, she didn’t quit the game for good until a year ago. Seguin’s sisters, Candace (15) and Cassidy (12), are aiming to play the college game. Candace often plays against a team from the Pittsburgh area that is led by Lemieux’s daughter. A good amount of the hockey wiring inside her son’s head, Jackie figures, developed over years of family car rides, going from game to game to game, whether those games were played by Tyler, Candace, or Cassidy. Paul, Tyler’s on-ice coach during his early years, offered insight and coaching from behind the wheel. No white board. No felt-tip marker. Two hands on the wheel, all minds on the game. All the while, Tyler’s appetite and understanding for the game was nourished by the movable feast along the highways and backroads around Toronto. Seguin was also exceptional at lacrosse, a game his father first encouraged him to play, said Jackie, because he felt all the stickhandling — cradling and rocking of the ball — was good for hands and related directly to development of hockey skills. “And good for his running and his adrenaline, too,’’ said Jackie Seguin. 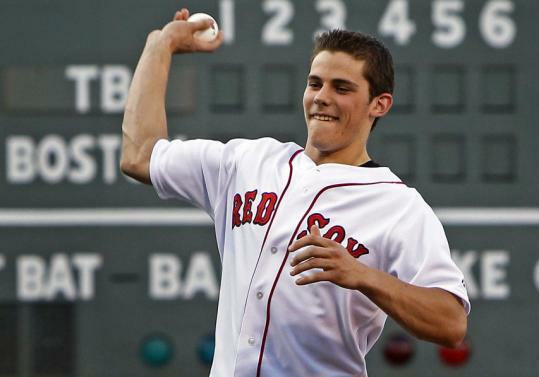 But at age 14, Seguin felt he had to choose between lacrosse and hockey. Each sport demanded a six- or seven-day commitment per week, and only a three- or four-day respite separated the two seasons. It was just not enough of a break for his liking, if not his well-being. A forward and midfielder, he found that his feet, especially his heels, couldn’t withstand the perpetual wear the two sports put on them, especially the constant pounding of lacrosse. Reluctantly, he stuffed his lacrosse stick in the closet and refused to touch it for a couple of years. On the back of his left arm, the length of the triceps area, Seguin has a tattoo that is sort of a family coat of arms. It reads, simply, “SEGUIN,’’ large letters in a vertical ribbon. For a couple of years, said his mother, he wanted a tattoo, but both parents insisted he wait at least until he turned 17 to get one. And even then, mom and dad would have to sign off on the content. When Tyler came home, explained what he wanted, and told his parents he felt it would be like “wearing my heart on my sleeve,’’ they checked off on it. Weeks later, in fact, his father got the matching tattoo, same arm, same design. Jackie Seguin booked the appointment and put down the deposit. A new hockey season is nearly upon us. The kids, with all their hopes and dreams and tattoos, hit the ice first thing Monday morning. The sweater for Tyler Seguin, the one that will cover that heart on his sleeve, is ready if he is. Kevin Paul Dupont can be reached at dupont@globe.com.